The Hub Review: Master Athol . . . and "the boys"
Master Athol . . . and "the boys"
Peter Mark Kendall and Johnny Lee Davenport in "Master Harold" . . . and the boys. Athol Fugard is a playwright with a great subject - the now-dismantled system of apartheid that held sway in South Africa for much of his life. Whether he is actually a great playwright is, I think, a different question - I don't think he is, not really. But then I'm not sure he has to be - for in the end his scripts are always transfigured by their terrible theme. Fugard approaches the question of racism so fearlessly (in his days producing theatre in South Africa he was pretty fearless, too), that when his dramas inevitably wind their way to their central dilemma, they are always suddenly gripping, simply because he conveys the horror of his topic so directly. Hence the overwhelming pathos of "Master Harold" . . . and the boys, one of Fugard's greatest successes, now at Gloucester Stage in a solid (and sometimes intense) production through August 12, in which Fugard brought the problem of racism excruciatingly close to home. The playwright has insisted the play is fiction, but his own first name is actually "Harold" (his full moniker: Harold Athol Lanigan Fugard) and the drama's setting, a struggling "tea room" in 1950, is not so very far from his own parents' first business (a general store), or the days of his own late adolescence. I think it would be fruitless to probe Fugard's life for further detail, however - these autobiographical elements are by themselves enough to explain much of the play's extraordinary power. For in "Master Harold" . . . and the boys, Fugard explores something subtler and more poignant than the social injustices (terrible as they are) of most racial dramas: he looks into his own heart to explore how personal emotional connection - even love - between the races in South Africa was inevitably crushed by institutionalized contempt. 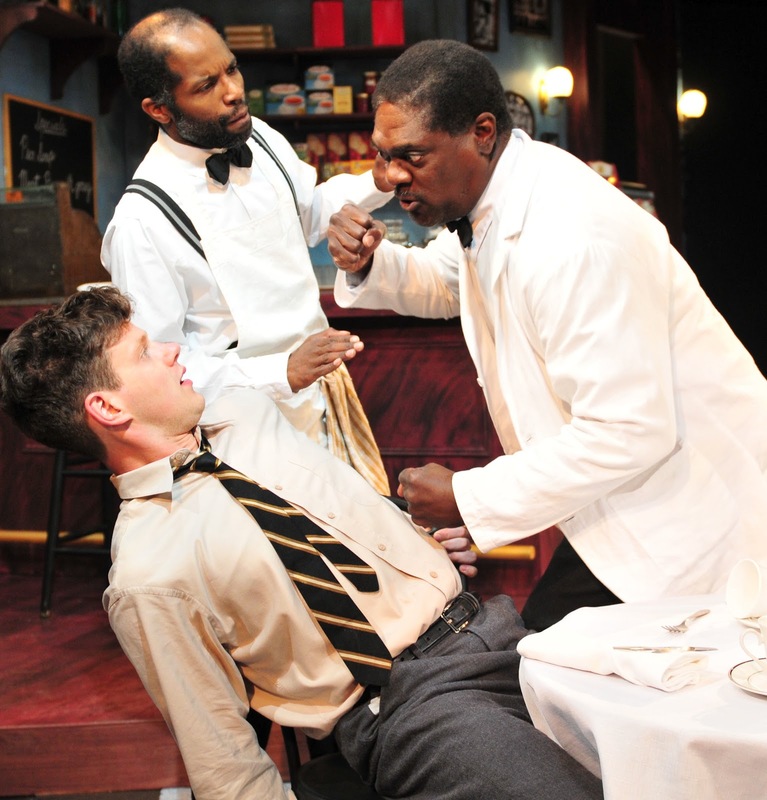 Young, morally-unformed "Master Harold" is portrayed as no better than his class, or his race - but as he is saddled with a cruel and distant father (who's also an alcoholic and even a cripple - yes, Fugard can lay it on sometimes), he has inevitably turned to his parents' black employees, Willie and Sam, for emotional support. To them, when they're alone together, Harold is "Hally," not "Master Harold" - and Sam in particular has become all but a father figure; indeed, one of his acts of generosity (the simple building of a kite) has come to symbolize for the young man something like freedom, and something like love. Needless to say, however, neither thing can survive the racist reflexes of South Africa, and in a moment of terrible stress (the news that his hospitalized father is about to return home), Harold turns on - and demeans - his only support system in a shameful demand for ritual humiliation (left). After all, Sam and Willie cannot love him, nor can he need their love - for in the eyes of his perverted world, "Master Harold" is better than they are. The play closes with the faintest ray of hope that he can someday be forgiven for this - but Hally himself seems to realize that's a long shot. 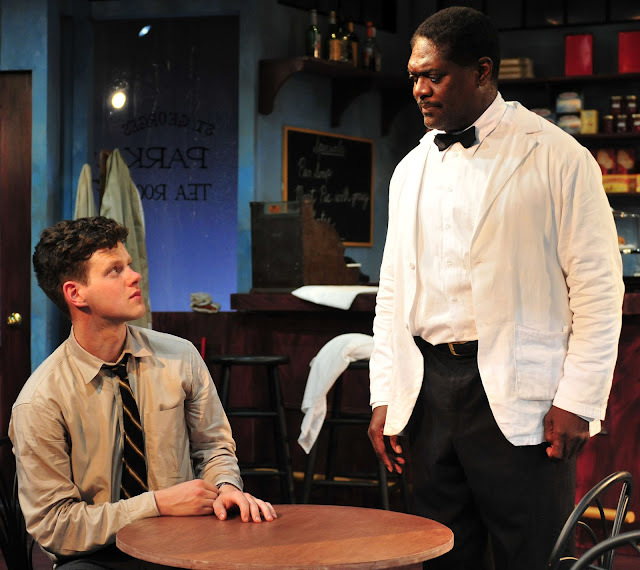 It's a devastating finale, and brought off with harrowing grace by newcomer Peter Mark Kendall (who looks and sounds just right as Harold) and especially local light Johnny Lee Davenport (as Sam), while on the sidelines, Anthony Wills, Jr., provides attentive, sensitive back-up as Willie. But on its way to those final heights, Benny Sato Ambush's production sometimes gets stuck in a few dramatic thickets of Fugard's own devising. The script works eloquently, of course, as a confession in the abstract, but the devil is always in the dramatic details, which are here beset by obvious symbology (the radio plays "You're the Cream in My Coffee," for instance) and some bald dramaturgy (the phone rings obligingly whenever it's time for a little more exposition). And there's a deeper issue with Fugard's conception, I think; the set is famously over-prescribed with realistic detail - but most of the items the playwright demands (like that song on the radio) are so overtly symbolic that they "poke through," as it were, the play's naturalistic conventions (despite an expert evocation here by designer Jenna McFarland Lord). And director Ambush has allowed something like the same contradiction to work its way through the performances. The actors nail their accents (at least to these ears), and certainly everyone taps into genuine reserves of feeling, but their delivery sometimes feels slightly over-scaled; there's hardly a moment that feels intimate, and completely unforced. This matters less in the terrible finale, however - and of course it's always a pleasure to see Johnny Lee Davenport sink his teeth into a substantial part. Peter Mark Kendall paints a deadly-accurate portrait of young "Hally" - who is by turns touchingly vulnerable and hideously arrogant - but it's the destruction of Sam's dignity (especially in the context of his love for his callow employer) that is the backbone of the show, and at this climax Davenport is riveting. I'm really not sure why we haven't seen this actor as Othello, or, to be honest, Lear - or in any number of classical roles. Perhaps our own staging conventions aren't quite as far from those of 1950 Johannesburg as we'd like to imagine!